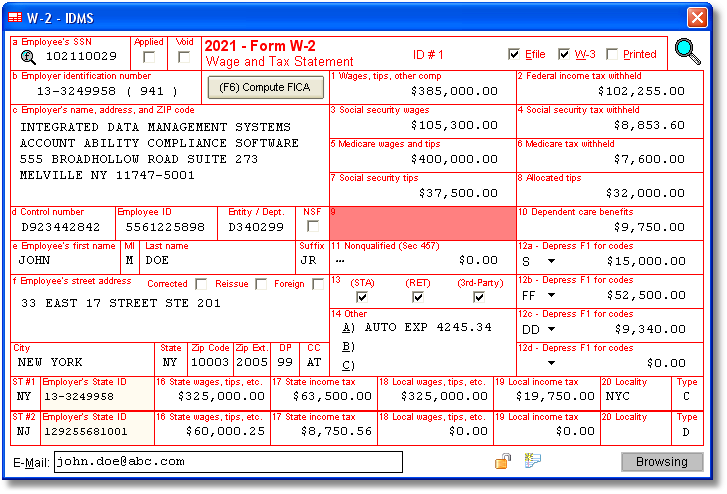 W-2 forms are maintained on user friendly windows that resemble the actual SSA form (as shown above). Calculates FICA and Medicare Wages and Withholding for Regular and Household Employers. W-2 forms can be keyed in or imported from text files, spreadsheets and SSA EFW2 transmittals. W-2 Forms can be rolled from year-to-year at your option. Supports an unlimited number of W-2 returns. Filters unwanted W-2 forms in seconds. Calculates and prints Form W-3 for SSA or an information copy for your records. Files SSA Copy A electronically (eFile) via SSA BSO or on SSA approved fillable forms. Files electronically with all 50 states. Complies with the Virgin Islands, Guam, American Samoa and the Northern Mariana Islands. Prints Employee copies on ordinary copy paper (see SAMPLE OUTPUT below). All of your W-2 forms reside on your computer (or network), not ours. Detailed State and Local Wage Reports drill down to City, School District and County Tax levels. Shop for W-2 forms and envelopes.